After a surprise midnite cocktail party at the “Caddy Shack”, MaryMargaret’s fantastic Paradise Palms time capsule of mid century modernism, we headed over to Sahara Ave. MM pointed out a building the preservationists are trying to save. So far, the current owner has agreed to build onto the existing structure to create his new strip mall. Hopefully, he’ll make the new parts match the historic mid mod building. 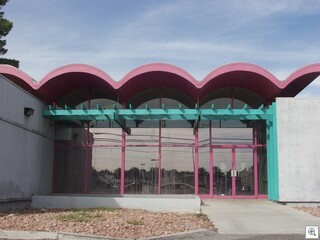 Lower Fremont Street, before it becomes Boulder Highway, holds several examples of the â€œspace ageâ€ architecture that was common in Mid Century Modern commercial buildings. This is the Findley Auto Dealership. Iâ€™m reminded of a bank building back in Columbus, Ohio, which I thought was so cool when I was a little kid. My brotherâ€™s going to take a picture of it and send it to me. Watch for it, Iâ€™ll do a post on it the minute I get it it. Many buildings like this and the Concha Motel Lobby dotted Fremont, Boulder, Charleston, Sahara and Las Vegas Blvd. All too many are now lost to the bulldozer. Fortunately, the La Concha has been saved and sits in storage awaiting itâ€™s new life as the the new home of the Neon Museum. 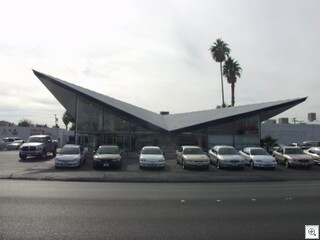 PS: The best way to ever get to see MaryMargaretâ€™s â€œCaddyShackâ€ is to join the Atomic Age Alliance, and get involved in our efforts to save historic Las Vegas Architecture.